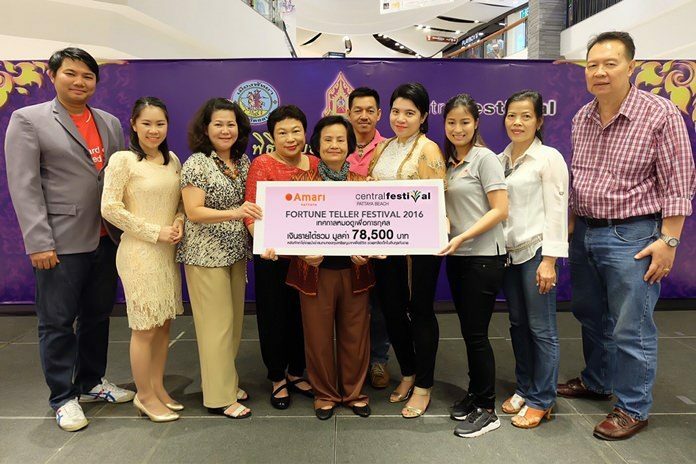 Amari Pattaya, in partnership with Central Festival Pattaya Beach and the Institute of Multi-Approach in Astrology, recently held a Fortune Teller Festival for Charity 2016 at Central Festival Pattaya Beach. Kriangkrai Wilailak (left), marketing manager of Central Festival Pattaya Beach, and Pornsook Pengmanee (5th left), president of the Institute of Multi-Approach in Astrology, presented a cheque for 78,000 baht to Kamonpetch Thawornwiriyanan (3rd right), for the Amari Pattaya Community Social Responsibility committee. The proceeds will be donated to ‘A Baht for A Better Life’ charity that aims to help children in rural schools. Previous articleCafé Delight – delightful!